Chester County’s Director of the Department of Emergency Services, Robert J. Kagel, introduced Smart911, a new emergency preparedness program at today’s Chester County Commissioners’ Sunshine Meeting. Smart911 is a free service that allows individuals and families to create a safety profile online which provides key information to Chester County’s 9-1-1 Center. Chester County is the first county in Southeastern PA to provide this service. Completely secure and private, residents control what information they want 9-1-1 and first responders to have in an emergency situation. The safety profile enables faster and more effective emergency response by law enforcement, fire and emergency medical services. Safety profiles can be created at www.smart911.com. Residents can customize their profile and share any information they want the 9-1-1 call taker and response teams to have in the event of an emergency. The information is seen only when the resident dials 9-1-1 and it is automatically displayed to the 9-1-1 call taker, allowing him or her to send the right response team to the right location with the right information. “Chester County has made some major investments in recent years to keep our residents safe. Our new emergency radio system reaches every corner of the county, the public safety training campus keeps our first responders up to date on effective rescue procedures, and now Smart911 will help to speed up response time to an emergency,” said Commissioner Kathi Cozzone. With Smart911, county residents can link both home and work addresses to mobile phones, which can be passed on to responders in the field for a more detailed, rapid response. Additional information, including pets in the home, vehicle details in the event of an accident, and emergency contacts can all be included in the safety profile. All information is optional and anyone registering can choose what information he or she wants to include. “The benefits of this information on a 9-1-1 call from a cell phone number are immeasurable,” said Robert J. Kagel. “Mobile phones do not provide an address to the 9-1-1 call taker. These emergency situations are often the worst moments in a person’s life, so with Smart911, having the additional information immediately at hand can ‘speak’ for that person, potentially saving their life. “Smart911 also allows residents to share information on specific needs such as disabilities and special medical conditions and we will be working with partner organizations like senior centers, autism organizations, Alzheimer’s associations and non-profits that work with the blind and the deaf communities, to encourage setting up safety profiles,” added Kagel. Smart911 is currently available in 40 states and more than 1,500 municipalities across the country. It has been credited with positively impacting emergency outcomes including a missing child where the girl’s photo and physical description were immediately available to 9-1-1 and responders, as well as a heart attack victim whose address and medical notes allowed the right responders to be dispatched to his location quickly. Once a Smart911 profile is created, it can appear in any 9-1-1 center throughout the nation that uses the system. So if a resident of Chester County is involved in an emergency situation in another municipality that uses Smart911, the safety profile information will appear on the 9-1-1 call taker’s screen when the emergency call is made. 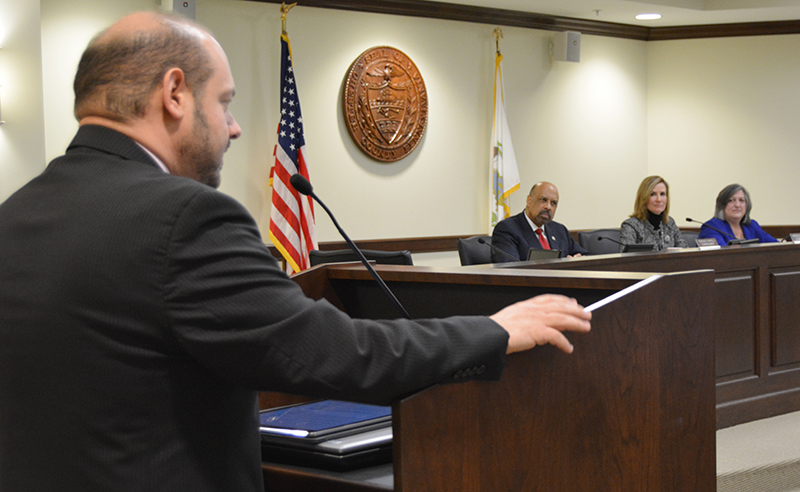 Photo caption: Director of Chester County’s Department of Emergency Services, Robert J. Kagel (left), introduces Smart911to the Chester County Commissioners and attendees at today’s Sunshine Meeting. Commissioners, left to right: Terence Farrell; Chair Michelle Kichline; and Kathi Cozzone.